Thulasi Stapana Puja will be performed at Brindavanam of HH Pujyashri Jayendra Saraswati Shankaracharya Swamigal on Sunday the 1st July 2018. On 29th, 30th June and 1st July 2018, Ekadasa Rudra Japa Homam and Chandi Parayanam & Homam will be performed followed by Abhishekam after Poornahuthi. 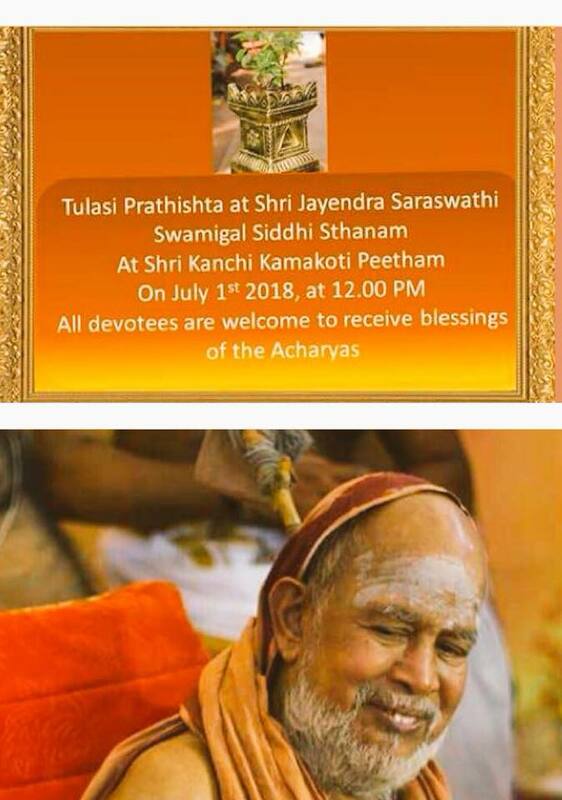 ​Devotees are requested to attend the functions and receive the Blessings of Sri Acharya Swamigal. Arrangements are on for erecting a Brindavana Structure and now the Base has been completed. Mrithikai ( Sand / Mud) brought from all Kshetras/ places visited by His Holiness from Manasarovar to Kanyakumari was brought and added to the Brindavan amidst vedic chantings. Similarly Theertham brought from all sacred rivers will be poured in the Brindavan on 1st July 2018 during Abhishekam.